Your training should be incorporated into your daily life.If you are doing formal training, make it short, a few minutes only and rather practice several times a day rather than one long session. Don't just practise in the home, practise in the garden, outside on walks etc. Always finish your training on a positive note. If your dog has done the exercise perfectly don’t try again, finish on a good note where you are successful. This ensures that both you and your dog will want to do it again at a later stage. Be consistent with your signals/commands/cues. All family members must use the same signals/commands/cues. If you are tired after work or in a bad mood, don’t train! It does not matter which word you use, what is important is the consistency and the manner used. Such a common mistake made with this are the cues ‘off’ and ‘down’. You teach your dog to ‘down’ on command and at some stage teach him the cue ‘off’ for getting off furniture etc. How many times have you mixed up the two? Your dog is on the furniture, ‘down’ you tell him and he promptly lies down. ‘Down’ you tell him again, his puzzled face looks at you “but I am down? ?” The same thing applies for the name we give to cues. For example if you decide on the cue for a recall as ‘here’, what does the poor dog think when mum calls ‘here’, Dad calls ‘come’ and the kids just say ‘Rover, rover, over here’. No wonder your dog is confused. Don’t feel bad if you have already being doing this, we all do it at some stage, all it takes is an understanding of the confusion you may be causing and you will soon find yourself stopping. Remember to only give a cue once – sometimes you will need to wait it out whilst your dog figures out what you want. If after 15 to 20 seconds your dog does not comply show him the treat or lure that you are using, shrug your shoulders saying “too bad” and walk away - if there is another dog in the vicinity, then give immediately to the other dog. If the dog comes up to you of it's own accord and presents the Sit, totally ignore, walk a step or two away, call your dog and try again. If the dog does sit this time, then reward with a Jackpot (2 or 3 treats - just like a gold star at school). Although dogs can discriminate between different words and can learn many, we have to remember that dogs are more likely to watch our body gestures and hand signals. If we think about it, the majority of communication between dogs is based on visual cues, so this is an area we can take advantage of to teach our dogs. We can then give our dogs signals without using our voices at all. This makes more advanced training much easier and can even save your dogs life in the event you can lift up your hand for the dog to wait, and even ‘down’, when in a dangerous situation. hand signal with the spoken cue. When teaching the dog to lie down, put your hand and arm, with the palm facing downwards and moving the arm towards the floor just before giving the cue for down. When we ask the dog to wait, use your hand and arm in the 'halt' position. Whenever rewarding a behaviour ALWAYS praise first and treat after. As mentioned in the section on Fading the Reward, you want to give as little as you can get away with and start to fade as soon as possible. Additionally, make the reward equal to the task at hand - if your dog can already sit well, then rather use kibble to reward on occasion, but when teaching something new, use a higher value treat. Jackpots are what are used when your dog does something exceptionally well or if he has been battling with an exercise, the down for example, and then he suddenly performs it, you can reward with a jackpot, which is an especially nice treat, or several treats in a row, really making a fuss about how well the dog has done and remember always praise first. When we teach a new behaviour we always treat 100% of the time to reinforce the behaviour we do want and start to fade as soon as the dog has understood and is performing the behaviour proficiently. My dog is only complying when I have a treat in plain sight. What am I doing wrong? The treats have probably been phased out too quickly and thus the trust and sequence has been damaged. The key to phasing treats is to gradually increase what you want from the dog and even in four years time it is important to give them a treat from time to time to keep them on their toes. Or, the dog has never been given the verbal cue BEFORE the lure/hand signal. In his mind he always has to have the lure/hand signal to perform the behaviour. Always use the ‘lure and reward’ method as this way we 'lure' the dog into the position we want and as the dog achieves it - the cue Sit is given. Hold a treat (sausage is excellent) between your thumb and forefinger right in front of the do's nose. As your dog smells it, slowly lift your hand upwards and backwards, going between the eyes and over the top of the head - with the dog following this movement.. As the dog’s head goes up, his rear end goes down and he automatically goes into the sit. As the dog goes into the Sit position, only then do you give the Sit cue. This means that the dog will associate the behaviour with the cue. This exercise needs to be performed slowly so that your dog doesn’t lose sight or smell of the treat. If you go too far above the nose, your dog will try to jump upwards to get the treat, so holding it as close to the nose as possible is the best. What is important, is that if your dog does not respond to the spoken cue immediately, DON’T keep on repeating it. Rather practise the exercise a few more times until the dog understands what is being requestions of him. If you keep on repeating the cue, the cue for sit then becomes ‘sit, sit SIT, SIT!’ As your do becomes proficient in the exercise, you can start to fade the reward as explained earlier. Don’t be in too much of a hurry to do this, make sure that your dog understands it perfectly first. When you get to the stage where you are requesting the Sit from a standing position, remember to stand up straight - not bending forward over the dog. This often results in the dog sitting further away from you as to some dogs it can be viewed as a threatening position. If your dog is sitting too far away, then use your treat to lure the dog closer and request the sit again. Always use your hand signal at the same time to further reinforce this behaviour. As the down position is a very submissive position for dogs, it is much easier to teach a puppy. Even so, it is not unusual to get a puppy that is hesitant to go into the down position. If this does happen, it just takes patience and practice and there are a few tricks that we will show you in class, if need be. With adult dogs there can often take a bit of time - the same as above applies - it just take patience and practice. To start with, depening on the size of your dog, you can either stand or kneel of the floor with the dog standing sideways in front of you (the dog standing sideways makes it much easier to achieve this exercise from the human aspect as if the dog moves backwards, it it easier to 'go with' the dog, than if it backs away from you). Lure it into a sit and then with the sausage right in front of its nose, slowly bring your hand down between the legs and slightly forwards. The dog's body will follow the treat and end up in the Down position. As the dog lies down properly, give the down cue and allow the puppy to nibble on the treat while lying down. Repeat several times until the dog understands. With your dog standing sidewards once again have the sausage in front of the nose and again bring your hand slowly down, this time with your palm open. Go straight down between the legs (which will result in the dog going into the play bow position) and then push the treat slightly towards the dog, going between the front legs and wait till it lies completely down before treating. Just take it slowly and easily and once again allow the dog to chew on the treat. Again the Down cue is only given when the dog has performed the behaviour. . Again, practice this several times. The manner in which both the above are performed, automatically creates the 'down' signal i.e. hand and arm outstretched and lowering towards the floor, saying 'down' at the same time. Make use of your dog’s natural behaviour at home. When you see your dog going into the lying position, wait till he is down and then reward the behaviour with ‘down – good boy’. When doing initial training with a dog it is always a good idea to have treats placed conveniently all around the house. As a fat dog is never a healthy one, you can use some of the dog’s food for behaviours he/she is already performing, but always make sure you have new and different treats available for learning new behaviours and for when you require a jackpot. Don’t only have your dog going into the down in front of you, practice getting him to do these behaviours next to you, behind you etc. Also, as he starts to get good at it start to get him to perform these behaviours in different places – when out for a walk etc. All too often, handlers tell us when their dog doesn’t want to do a behaviour “oh but he does it so well at home!’ Home is easy, different locations are much more difficult. Another point to remember, is don’t repeat the exercises too often as your dog will get bored, rather do several different one’s and throughout the day. Always remember to finish your training on a positive note. We, as humans get so excited when our dogs do perform an exercise perfectly that we very often say to family, “look, look” only to have the dog refuse to do the exercise! As hard as it sometimes is, quit when you are ahead! Place a treat in your palm and turn your palm upwards, holding the treat with your thumb against your palm so that the dog can smell it. Slowly raise your hand upwards and at the same time slightly forward. This will encourage the dog to stand up, but do not lift your hand past the dog’s chest otherwise he may confuse it with “sit” if in the down position. Only move your hand enough that the dog stands, but does not move forward. As soon as your dog stands praise him and give the verbal cue – stand. Your hand and arm going forward with the treat in it, is bringing in the signal 'stand' that you can use when your dog is proficient in this exercise. Once your dog has mastered all the above you can start to mix them up and also start fading the reward at the same time e.g. As for a sit and a down, and only treat after the down : do all 3 exercises and only then reward ; mix up the sequence of asking for the above behaviour. This exercise can be used in any situation to get your dog’s attention on you. It is especially good in tense situations such as a visit to the vet, crossing busy roads or even to get your dog’s attention away from anything that may set him off, such as bicycles or postmen, or strangers approaching. In the case where a dog is reactive to other dogs this exercise is invaluable. When the dog looks at you instead of the other dog, this is interpreted as a calming signal by both dogs and will result in a lessening of aggression and give you the time to get your dog out of the situation. This will also raise you up in the combined human/canine social structure as your dog will realize that you understand that certain situations could be perceived as being threatening to it and by taking charge and diverting the dog's attention onto you, you are showing that you can be trusted to assist the dog in any situations it can't handle. The more the trust is build and you take charge in this manner, the more the fear towards perceived threats will reduce. As your dog looks at you, say “watch’ and reward. As your dog becomes proficient at this, you can start to extend the period of time of the watch and then start to build in different distractions and practice in different locations as well. A ‘watch’ in the home environment is very easy to achieve, but not as easy when out for a walk and another dog is approaching, so the way to do it is to practice, practice, practice! When starting this when out for a walk, use higher value treats, especially one's with a strong smell such as cheese, biltong - will be easier to get the dog's attention. This needs to be reinforced constantly, in different situations with different levels of difficulty and distraction throughout your dog’s life. The Watch cue is NEVER faded, each and every time you see Watch, your dog will be rewarded. If your dog is at all reactive to other dogs and you have not had the time to practice and get a solid watch in place, then practice the 'Yippee' exercise as well. This is very simple but also very effective. Have your dog on lead and either work in the garden or out on a walt. Have a really tasty, smelly treat in your hand, and as you walk along with your dog, pretend that a tree, shrub or some object is (in your mind of course) a really nasty, threatening looking dog coming towards you on lead. Do an immediate U turn in the opposite direction, luring the dog with the smelly treat and saying 'Yippee' in a happy tone of voice. As you get a bit away from the perceived threat, reward with the treat. The vocal 'yippee' in a happy high pitched voice helps to get the dog to look at you as not an everyday noise, lowers or removes stress in your voice to a minimum, in the case that you do this with a real dog, the dog see's this exercise as both fun and rewarding and you are taking the dog away from any perceived threat. Not all dog are food driven, and it is possible to use a favourite toy/ball instead of food. Simple – because we allow it to happen and follow behind them! This is nothing to do with the dog being dominant as many people still think. It may sound a bit crazy to us humans that a dog can actually choke himself to get where he wants to go, but as we have seen so often, that is something they do with regular monotony and because the dog is rewarding by going in the direction he wanted too, the behaviour is further reinforced and the dog will continue to pull, maybe even harder. A further reason on this point is that dogs walk much faster than us and it is extremely hard for a dog to walk slowly when learning to walk on lead without pulling. Another reason that lead pulling can become a learned behaviour is due to their sense of smell. Scent is extremely important to a dog and when they get a whiff of all the exciting smells just waiting for them to investigate across the road in a patch of grass, I think they often forget we, the handler even exists – the smells wafting towards them are just too good to ignore. This is especially true for the dog that rarely gets out – imagine how difficult that must be for the dog? Another very important reason that dogs continue to pull is that we activate their opposition reflex or pulling reflex. All animals, including humans, have an opposition reflex, it is a natural reaction that we can’t control – we do it without even thinking. If somebody holds your hand and pulls you, before you realize what you are doing, you will have pulled back – dogs do exactly the same. As a TTouch Practitioner, I prefer to work with pups and dogs using two points of contact such as the lead being attached to the front and the regular ring of the harness, or to the collar and the harness. Simply by doing this you are helping to put the dogs body in balance. The lead in this case would be held in two hands, with the one hand holding the collar section and the other hand holding the section coming from the harness. Remember that your dog reads your body language. If our own bodies are out of balance how on earth our dogs can body be in balance? It is said that dog training is 75% the owner’s position and the balance of 25%, the dogs! Think about it, if we exert a pulling pressure (opposition reflex), whatever we are pulling against will just pull harder, hence the handler water skiing behind the dog! The further forward we are in relation to the dog, the harder it is for the dog to pull and the easier it is for us to control the dog. The ideal position is in line with the dogs shoulder. The dog will then react to, not only our cue but the movement of our shoulders, hips, arms, hand and feet. Another point to bear in mind is – is the handler’s whole body relaxed? Remember that if you are tense that tension will travel right down the leash and be transferred to your dog. This, to me, is one of the most important steps to take. Why not get your dog under control and not pulling in the home environment rather than wait till you are outside? If your dog is pulling and yanking you in the house I can pretty much guarantee that outside won’t be any better. 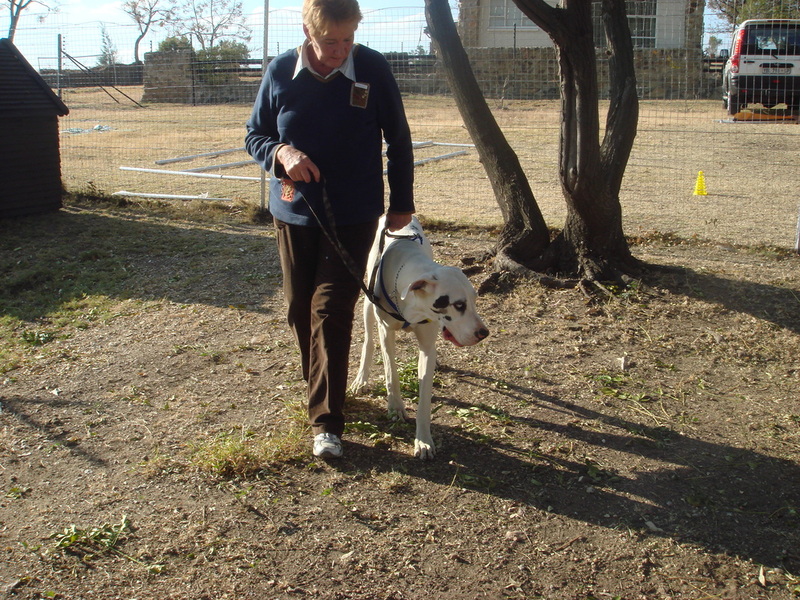 a) Firstly use management and change the location where you normally keep the leash. b) Go to the new location, pick up the leash, ask the dog to sit and then put the leash. Now the odds of this happening with a dog that normally goes nuts when seeing the lead are, to put it mildly, small! As the dogs gets madly excited, put the lead back in the new location, walk away and go and sit down with no interaction with the dog at all. Repeat over and over until the dog actually sits – this is a form of negative punishment – we are taking away from the dog that which it wants the most. It may take some time, but persevere; the dog will settle and sit. c) If, when the dog is sitting it starts trying to jump around as you clip the leash on, either unclip the leash and put it on a nearby table, or in the case where you cant get to the clip due to the dog jumping around so much, drop your end of the leash on the floor and walk away and go and sit down. A word of warning here, if you have a dog that tends to bite or chew on the leash, smear citronella oil, Vaseline etc on the leash first or use a chain leash. d) Always insist that your dog sits while you put the lead on – if the dog stands at any point while you are putting on the lead, either unclip it or drop it and walk away. e) Repeat the above several times a day – we are not going for a walk here, we are teaching the dog how to behave when the lead is attached. With the majority of dogs I work with, this can be achieved during a session, all it takes is consistency. you find that you are getting annoyed or angry, rather put the lead away and have a break and try again a bit later. f) The next step is when the dog is sitting quietly, it to start walking towards the door. This is achieved by taking one step at a time. Think about it, if your dog can not walk out of the house without pulling, how on earth are you going to get the dog to walk when on the street or in the park? If, after one step, the dog is pulling, simply stop every time the dog pulls. It really is better to do this slowly, taking one step at a time if the dog is pulling, then two steps etc, until you have perfected this exercise. g) This exercise must be repeated going through the door and the gate to the outside. It is a lot of repetition and initially a lot of work, but it works with consistency and a dog learns the new regime very quickly if the owner sticks to it. All too often we get ourselves into the situation that we just don’t take our dogs out for walks anymore as the pulling, jerking has become so impossible, that the walk becomes a hardship rather than a pleasure, no matter how much our dogs enjoy it. When our dog pulls on the lead, we automatically pull back, and so begins the ‘too and fro’ of compulsive pulling, and all that happens is that it gets worse and worse. Because the dog is not getting the outside physical and mental stimulation it needs, the dog becomes even more excited when we do take it out and the pulling gets worse – your dog is now on the way to becoming a ‘professional’ – a ‘professional’ puller that is! There is a way to counter-act this. It is one of the many tools that are used at Tellington TTouch to assist with dogs that pull, even ‘professional’ pullers, and with a little bit of practice and a lot of consistency, YOU can stop your dog from pulling by making use of the Balance Lead. In addition to being used with a head halter, the balance lead acts in a different manner than the normal lead as when you ‘ lift and release’, rather than pull, it brings your dogs body back into balance, stops the habitual pattern of pulling and your dog will be more likely to listen to your requests and lastly the dog cannot pull downwards. Additionally, the balance lead acts as two points of contact, and in TTouch we have observed that the section of lead that is placed over the dogs chest appears to help them calm down and listen to what we are requesting it to do. 1. Attach the larger sized clip to your dog’s collar, and with the other end of the lead, attach the small clip to one of the rings to form a loop for you to hold. You have 3 different positions to position the lead onto various rings on the lead, to adjust to fit you comfortably depending on your height and your dog. 2. Position your dog so that it is standing next to you, not in front or behind – in the ‘heel’ position. The lead should be held in such a manner that you have contact with the dog – not too long or short, just that if you lift your hands slightly, it will cause the lead to tighten and if you lower your hands, the lead will become slightly loose and there will be no tension. If the dog is in front, it will be more inclined to try and pull, and if behind, you will get into a ‘dragging’ situation. Some dogs may object to this initially as it is a new and strange experience and start to fool around. If this is the case, just practice putting the lead on and taking it off again until the dog is comfortable with it. Your next step is to ask the dog to walk forward. Only try for one or two steps initially, as the dog will go into the habitual ‘pull’ at first. 3. Stand with your dog on your left hand side and holding the looped section of the lead in your right hand, simply place (or loop) the long section of the lead over your dogs chest,. Gather up the slack on the right hand side of the dog and you will find that you end up with one hand holding the looped section and the other hand holding the lead about half way down. You can adjust the lead to a comfortable position for you both with the additional clips supplied. 4. When this happens, quickly do several, very quick upward “ pull and releases”, and you will find that the dog will stop pulling and you will feel the body come back into balance. This is totally new experience for your dog but it will take practice to master this simple, but very effective way of stopping your dog from pulling. 5. If you find that the lead is slipping off the chest which often happens with small or narrow chested dogs, just slip the furtherest away section of the lead under the outside leg and it will then cross the chest at an angle, rather than straight across. a. Always look straight ahead when walking with your dog, not at the dog. b. Anticipate any pulling (e.g. seeing a dog in the distance, nice smelling tree coming close) and the second you feel your dog lean into a pull, just perform an upward “pull and release” to bring the body back into balance. When the dog is walking in the new ‘heel’ position, keep on repeating the ‘heel’ cue so that the dog will associate this position with the cue. c. Gary Player once said “the more I practise, the luckier I get”. That is all the use of this wonderful piece of equipment requires – practice and consistency. Don’t even let your dog pull when leaving the house-this is when your walk starts, not in the street. d. If you want the dog to walk on a longer lead to investigate, rather get into the habit of issuing a cue such as ‘go smelly, free etc’, so that your dog knows it is allowed to walk on a longer lead. e. Use the lead over your dog’s chest when at the vet (or any other tense situation, or crossing the road, at shops etc) to contain and settle the dog without jerking and pulling on the lead. f. The balance lead can be used with a Halti in the same manner, giving you two secure points of contact and making the Halti easier to manage and more comfortable for the dog. g. The balance lead can be used in conjunction with a harness. h. PRAISE your dog for walking nicely e.g. ‘good walkies, good boy’. We have a habit of telling our dogs what we DONT want, and not praising them when they do what we DO want. i. Get your dog into the habit of sitting next to you when it stops, every single time. j. Even when out for a nice ‘sniffing’ walk, use the heel position with the balance lead every 40 to 50 metres to really reinforce the walking you do want, and get your dog to work for you when out for a walk. An example of this is that in addition to getting the dog into the ‘heel’ position; ask for sits, downs, waits etc on a regular basis. This will keep the dog interested in what is going on, teach him self-control and raise you higher in the combined human/canine hierarchy. k. If you have a dog that chews and bites the lead, this is caused by over excitement and the owner awarding further attention. Apply either pure Citronella oil, or Listerine mouthwash, Vicks Vapour Rub or Mr. Min directly to the leash stop this behaviour and go back a few steps, as the dog is not coping. There is a big difference between the ‘stay’ and the ‘wait’ command. With the ‘stay’ command, the dog is required to stay in the position (either sit, down or stand) and location you leave it until you return to the dog. Only then is the dog given the free command. With the ‘wait’ command, the dog has to wait where it is until either you call it to you or return to the dog. This exercise can be used at doors, top or bottom of stairs, before getting out the car etc. Have the dog next to you in the 'heel' position. This exercise can be started initially on lead which often makes it easier for the dog. Say your dog's name, then Wait, at the same time holding your hand right in front of the dog's face, like the Halt hand sign. Count to about 10, then say 'good wait', offer a treat and free the dog by running backwards and saying 'Free!!' at the same time. The reason we always release the dog backward is that by doing in this manner, the dog will never break the Wait by anticipating you returning to its side. Build up the time period to about 30 seconds. You next step is to give the cue and the hand signal, but this time take one step forward and turn so that your are standing directly in front of your dog. Keep on repeating the Wait cue and keep your hand/arm in the Halt posistion. Now step back to the dog's side, saying 'Wait' before you move. Stand at the dog's side a few seconds, then praise 'good wait', reward with a treat, and again Free backwards. Now you can gradually build up the distance and also the duration. With the Wait exercise it can be compared to building a house - the foundations must be solid otherwise cracks will appear - the cracks would be the dog breaking the wait - this normally happens because you have gone too fast too soon. The last thing that anybody wants is to have a dog that snatches food out of our hands, especially if we have children. So often when we offer a dog a treat, you are lucky to come avow with your fingers intact! By teaching this exercise the puppy learns to have control over his jaws. This does not mean that he will never bite, but he does learn to control the force of the bite thus reducing the chance of serious damage. This exercise must ALWAYS be taught on its own. In training we train with a lure in our hand to entice the dog into the heel position and if you started shouting at a dog for snatching you would simply destroy the training side and your relationship. If your pup snatches at your fingers when training, just hit yourself over the head with the newspaper for not practising this exercise enough! A soft treat here is preferable, something along the lines of a chicken Vienna sausage. Hold the treat in your hand and offer the end of the sausage to the dog. Allow him to nibble and lick it and praise him quietly while he is doing this. If he snatches at the sausages or bites down hard, shout OUCH! in the loudest voice you can muster and storm away from him with your arms folded. It doesn’t matter if it did not hurt; it is the effect we are going for. This is a similar behaviour that a mother dog would perform if her puppies were biting at her teats, she would yelp, stand up and walk away. Your dog may look totally amazed and try to follow you. Turn away a few times ignoring him. Then ask him to sit and once again offer the treat, repeating the sequence over and over if he snatches or bites hard and praising him quietly if he takes it gently, by saying ‘good gently’ or similar. This needs to be practised over and over and in more and more challenging situations. Do you call your dog to take it for a bath when it hates bathing? If so, rather go to the dog and lead it by the collar to the bath area. Have you ever called your dog to you to punish it for some misdemeanour? Where punishment is concerned, it must occur while the dog is caught ‘in the act’, or else not at all. Dogs do not associate the behaviour of having had a wee on the carpet to being reprimanded for this when you call them. Rather they associate the behaviour of returning to you as that which caused the punishment! What about your own voice and body language? If you are bending over (threatening action to a dog) and screaming and shouting at the dog to come to you, would you return – no way! Think about the case wherein a dog is out for a walk, perhaps on a choke chain, and the owner calls it to return to him/her. The dog does not respond and a few seconds later it receives an almighty jerk on the lead! What about the situation in that you are just going to leave for work and call Fido to take him outside. As you reach for his collar he dashes away, leaving you to run after him. Well that is one of a dogs favourite games and according to my own dog it is called ‘catch me if you can’ and is great fun! The one thing you never do with a dog that is running away is give chase – rather go against all human instinct and run in the opposite direction, clapping your hands and calling in a happy voice – ‘come Fido, come’. When the dog does turn around and follow you, reward him lavishly for returning to you, don’t just grab the collar and put him outside. Another one is calling your dog to take away a valuable item (to the dog at least). Rather practice the Swap exercise which will take care of this situation. You are at the park and your dog is having a great time, you call him to return to you and result – you are totally ignored. To overcome this, follow the Real Reliable Recall method below, and then practice in the park as well. One of the most important exercises that we can teach out puppy is to come when called. The prime thing to remember is that when we call our puppy, it must ALWAYS be a good experience. Don’t call your puppy is you are going to reprimand it in any way. If your puppy doesn’t like being washed or groomed, then don’t call it, go to him and perform the action. Another important point to remember is not to call your puppy ONLY when the fun is going to end. An example of this is having the puppy running free in the park and as soon as you call him back, you slip on the lead and take him home. No wonder dogs are reluctant to come back to us so often! Rather call your dog to you often, pet or praise him for coming, offer a treat and then ‘free’ him/her again to go and have fun. You can take this even further and practice putting on the lead and taking it off again. That way the puppy never knows when it is going to go home and the fun end. Another point to take into account is that as in all training, your cue to call your puppy must be consistent and used by all members of the family. While you are practising the recall at home and out on walks, make sure that your pup will always come when called, never set yourself up for failure. If your pup is busy smelling a particularly interesting smell and you think he/she may not return, just don’t call. Wait till the pup has finished and then call him back to you. This way you set yourself up for success, not failure. As your pup realizes that it is rewarded every time it returns to you, you can start to make the circumstance a bit more difficult. Remember that when you are recalling your puppy, to guide it directly in to you, feeding on your own body and leaning back slightly, as demonstrated in school. If at any stage your puppy runs away from you instead of towards you when you call, DON’T run towards it, turn around and run in the opposite direction, clapping your hands and calling its name. Bring in the fun element when practising and play hide and seek with your puppy. A wonderful game for the whole family (and here don’t forget to include your home helper, often the only person at home to call your dog if it gets out the yard) is to take one of your puppy’s meals, divide it equally between all members of the family and have a game calling the puppy from one person to the other and feeding when the puppy comes. This really reinforces the recall and makes it a very pleasurable experience for the pup. Please also read our article on the Real Reliable Recall which really is something that every dog owner should have a firm grasp of. Once again, this may seem like a strange exercise to perform with your dog, but when we realize that so many dog bites occur when we try to stop our dog charging at another dog, jumping unexpectedly out of a car, or similar circumstances, we can then see the necessity of teaching it. That our dogs do try to bite us in these circumstances is not unusual. It does not mean they do not love us; it is simply a case of redirected aggression. To practice this with you dog, simply grab at the collar when he/she is lying quietly and then give a treat immediately. As you dog gets used to this, make the circumstances more challenging by grabbing when he is playing, going to eat, returns to you from a recall etc. Remember to treat every time to make this a rewarding experience for your pup. Your next step is to add a shout/scream into this exercise. What often occurs is that we shout/scream unintentionally when our dog will make a dart for another dog - this simple exercise can help to avoid redirected aggression. Place a treat in your left hand and have one ready in your right hand. Show her the food in your left hand but don’t let her have it. As she tries to get to it say Leave it in a low growly voice. As soon as the dog stops struggling to get to the food say GOOD Dog and give the treat from the other hand. Repeat this over and over before going onto the next section. If dog struggles use the No-Reward-Marker, e.g. say Ah-Ah, and hold on to your dog - it is essential your dog does not get the food when you have told her to “LEAVE”! As soon as your dog stops resisting, even a tiny bit, praise her and give her a treat from your hand - not the piece you placed on the ground … you told her to LEAVE it so she cannot have it, ever! Pick the food up from the floor and repeat from the beginning. When the above is going well, repeat and move the food progressively closer and closer to your dog. When the food is about 20-30cm in front of your dog and she can restrain herself, you can do the same exercise with your dog lying down but do bear in mind that by changing the starting position, you have effectively changed the criteria and thereby made it a ‘new exercise’, so begin the LEAVE in the down position by placing the food at least 1 meter in front of her before, once again, gradually moving it closer and closer until it is right in front of her. This is a wonderful exercise whereby you can teach your dog to drop whatever is in its mouth without getting into a fight. The sooner this is started the better. This gives you an excellent method of getting unwanted or dangerous objects out of your dog’s mouth without a tug of war and without injury. The reason that a dog does not want to give up objects from its mouth is simply because they get taken away! Do this initially when your dog is hungry, not just after a full meal. Have a toy he likes (but not his favourite), play a bit of tuggy with him, then when he has it in his mouth and you are holding the other side, show him the treat (here make it something worthwhile, not dry dog food), say ‘swap’ and as he drops the object, give him the treat and here this is very important, immediately give him back the toy! The dog has now learnt that not only does he get a reward when he gives over an object, but he actually gets rewarded for doing it and he gets the object back! Practice this over and over, gradually working up to really favourite toys. If your dog is reluctant to swap his favourite toy, then simply have two of the same! He swaps it, gets rewarded and gets the same object back. What fun. This is another way to start the retrieve exercises when your dog gets a bit older. Don’t rush this, all learning should be fun – going into matric when you are only old enough both physically, emotionally and mentally to go to Standard one is not much fun! To start the retrieve process get your dog interested in the toy on a rope. “Tease” him a little with it and keep it moving on the floor so that this motion imitates the 'prey' - encourage him to chase it while you are dragging it on the ground. If your dog is not keen on a rope try a squeaky toy on a string that you can drag around. If your dog chases it and picks it up praise and encourage him and try calling him to you to give you the object. Now start the THANK YOU/SWAP exercise. If your dog is good at fetching, but not returning the item - simply use management and have the toy attached to a piece of rope or string. Start as above and gradually throw further away from you, always, say 'bring' and as the dog returns to you, swap as above. If the dog is not returning to you, use the string/rope to gently guide him back to you. Start this at a distance close to you and then build up the distance. Heeling or walking next to the handler’s left leg is very different to loose leash walking. I prefer to use heeling only when I need my dog to be under my total control such as when I cross a road or walk into a vet. Heeling is very hard for a dog as it requires a lot of concentration and I prefer that it not be done for more than a few minutes at a time. Walk away from your dog so that your back is to him and call his name in a happy inviting voice. As you call use the treat in your left hand to lure him to your left side. Be careful not to reach out to him – try and GLUE your hand to your left leg and make him come to your hand. If you have a small dog be careful of the treat being too high because it will cause them to jump. Only reward when he is in position i.e. next to your left leg and facing the same direction as you are going. As soon as he comes to your left side say “HEEL” and reward with the treat in your left hand. Now walk away again and turn slightly to your right to make it easier for him to come to your left side and at the same time take another treat from your right hand and put it in your left hand. As soon as your dog has caught on the game and reliably comes to your left side when you place your hand in position start saying Heel before luring your dog. Don’t shout (our dogs all have perfectly good hearing) and don’t say Heel in a threatening tone (who wants to come to someone who threatens you?) Say Heel in a happy excited voice! Kindergarten heeling When your dog has learnt to come to the heel position you can start work on the actual walking at heel part. Begin by giving your dog the treat whilst you take a step forward instead of when he is in heel position like you did in the Find Heel exercise. Increase the steps that you take slowly - keep heel work very short and only gradually increase the number of steps that you take. Dogs are more sensitive to visual than verbal signs so ensure that your visual signals are consistent by always stepping off with the left foot when you want your dog to heel. Stepping off with your left foot when you want your dog to heel and with your right foot when you want to get your dog to stay makes it easier for them to understand what we want. 19. Excessive Barking Excessive barking is a common complaint from many pet owners. To best understand how to stop excessive barking it is imperative to understand why dogs bark in the first place. WHY DO DOGS BARK NORMALLY? How these different barks are dealt with from the beginning may decide whether a dog develops a barking problem or not. The primary function of a bark is to alert the rest of the dog’s social group to possible danger. So, when your puppy barks, investigate. If the reason for barking is insignificant - a bird for example - then simply ignore the puppy. If the reason for barking is of significance - the arrival of people for example - then praise the puppy and perhaps even reward him without overdoing it. With constant attention from you the puppy soon learns to discriminate with its barking. By always ignoring the puppy's barking and never investigating, the puppy will grow up into a dog that barks with the same excitement and vigor at a burglar or a bird - he has never been taught what deserves a bark and what doesn't. Dogs also bark at other dogs and humans to solicit play. This type of barking is very distinct, with the puppy also adopting a play bow, perhaps even jumping and then bowing and it is a short bark often preceded with a soft growl or whimper. When your puppy barks like this is it not to be investigated as it is not an alarm bark. Playing with the puppy when it barks like this straight away will encourage the puppy to become a vocal dog. Dogs that are hungry, cold, thirsty etc. will bark to indicate discomfort. The solution is simple - provide the dog with what he needs. It is important however to not jump to attention every time you hear a bark as your dog will soon figure out that barking gets him immediate attention. Dogs that are denied a perceived privilege may bark out of frustration. Very often this perceived privilege might be the neighbour's cat sitting just out of reach. Also a confusing strange object (such as a new lawnmower) may be barked at to try and establish the nature of this strange object. Some dogs will also bark out of excitement. Boredom - This is the most common cause. If the dog's environment and daily schedule do not provide adequate stimulation (both mentally and physically) a dog will often resort to the "sound of his own voice" to break the monotony. Fear - Under socialised dogs and dogs with a fearful genetic temperament will bark excessively. These dogs tend to live in a constant state of fear and are always calling for their group to assist with a perceived threat. Over Stimulation - Dogs that can see pedestrians and passing activity through a gate or fence may develop an excessive barking problem if they cannot cope with the volume of stimulation. This is not a common cause of excessive barking, as the dogs generally tend to ignore the stimuli after a period of time. Owner Reinforcement - Dogs are very often unknowingly encouraged to bark by their owners. If the dog is ignored when he is quiet and then paid attention when he barks excessively, he has been taught that being noisy gets him attention. Even if the attention is “aversive” i.e. shouting or even smacking, dogs will either avoid punishment by darting out of reach (and barking more due to the excitement) or they will endure their punishment and start up as soon as they are being ignored again. Allelomimetic Behaviour - In a nutshell this is mimicry. A dog in a noisy household will often become an excessive barker as he is simply following the behaviour of the rest of the pack. Obsessive Compulsive Behaviour - This is a neurological condition and fortunately it is rarely the cause of excessive barking. Physical Abnormalities - Dogs with physical abnormalities and disabilities (deafness, blindness etc.) are more prone to becoming excessive barkers as they feel the need to "call their group" more often. Elderly dogs often develop an excessive barking problem due to loss of sight and hearing. Toys - The dog must be given suitable toys, which should be rotated so that he does not become bored with them. Digging pit - All dogs love to dig and a digging pit lets them indulge to their heart's content without destroying the garden. Treats, the dog's daily food ration and toys can be buried in the pit to encourage digging in the pit only. Exercise - A 15-minute walk twice daily goes a long way toward solving excessive barking as the dog can get physical exercise and the sights and smells along the way provide good mental stimulation. Splitting meals - By splitting the dog's daily meals into smaller portions the dog does not go through the "charged battery" syndrome and it feels fuller for a great part of the day and less likely to bark excessively. Training - Obedience/agility/tracking training also provides the same benefit as exercise while also teaching the dog commands and enhancing the bond between owner and dog. Practice sessions at home provide stimulation and without them training is of little benefit. Remove the cause of the dog's fearful reaction. This may sound obvious, but it has solved many excessive barking cases! Change the reaction. By playing a game with your dog and giving your dog treats consistently during what normally causes him to bark e.g. thunderstorms; your dog will soon look forward to these events that previously caused him to bark. Under socialised dogs and dogs with a fearful genetic temperament will often bark excessively. These dogs tend to live in a constant state of fear and are always calling for backup against a perceived threat. This is not a frequent cause of excessive barking. The answer is to restrict the dog's visual access to what is causing him to bark - this often provides a solution within a very short period. You will need to set this up by asking someone to come and ring the doorbell in order to get the bark. Have a lovely smelly treat handy. When the doorbell rings and barking starts, allow the dog to bark 4 or 5 times, telling the dog at the same time 'bark, bark, bark', then wave the treat right by the nose and as soon as the barking stops, reward with the treat, bringing in a verbal cue like “silence” or “quiet”. Repeat this as often as possible. This approach can and does result in problem behaviours such as defensive aggression as well as learned helplessness and attention deficit hyperactivity disorder (ADHD) if the punishment is applied incorrectly. The addition of punishers (positive punishment) is thus best left to highly experienced and knowledgeable handlers who choose to go this route. Please note that the use of aversives and distractions can be classified as positive punishment and while these may be used with discretion it would be better to avoid the situation that necessitates their use in the first place. Very easy to use and with very little risk of problem behaviours developing, this is the approach of choice. With correct usage of reward this approach gets the best results and enhances the bond between puppy and owner. Our dogs learn very quickly and by using some additional teaching tools we can make this process even easier. We need to teach a “teaching language” which will aid us tremendously in communicating with our pup.